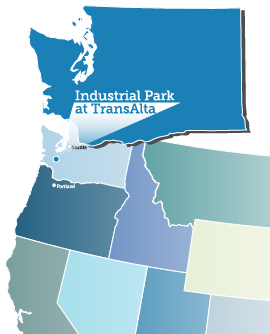 Industrial Park at TransAlta-USA (IPAT) is community owned, and has significant flexibility in negotiation and deal making. Our 4,400 acre industrial park is focused on serving larger tenants and those that require access to major utility services. IPAT was created through a partnership with TransAlta, Inc., the Washington State Legislature, Governor, and various local organizations. It is a community based non-profit group that is focused on job creation. The board of directors is made up of local leaders that have the vision and commitment to provide job investment opportunities for our future. Our community is developing this park to serve the unmet need for large acreage, large volume water, major electricity, and rail access customers.